Christian Dior Miss Dior Eau Fraiche suitable for the spring season. Christian Dior Miss Dior Eau Fraiche 100ml. Eau De Toilette - French brand Christian Dior is preparing another version of the sign flavor Miss Dior. The new version was called Miss Dior Eau Fraiche and perfumers described as elegant and sensual fragrance for bold women. Author green chypre-floral pyramid became Francois Demachy. Pyramid open citrus motives and green galbanum notes that give way to the flower bouquet, which is dominated by jasmine. Conclude pyramid chords patchouli. a fragrance for women, belongs to the group floral chypre fragrances. This is a new fragrance, Miss Dior Eau Fraiche released in 2012. Top notes are citruses, bergamot and Galbanum; notes are jasmine and gardenia; base note: patchouli. The French brand Christian Dior is the new fragrance Miss Dior Eau Fraiche. Elegant and sensual fragrance for bold women. Author green chypre-floral composition became Francois Demachy. Top notes: galbanum, citrus notes, jasmine and patchouli. Fragrance created in 2012. 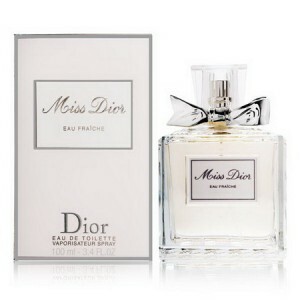 Christian Dior Miss Dior Eau Fraiche is lightweight and very delicate novelty of 2012. This amazing scent based on citrus-floral tones. Popular series of Miss Dior reaps success especially among the young generation of girls and women who mediation amazing flower compositions spreads its charm and youth to the outside world. Get the charm and uniqueness of a sophisticated fragrance especially suitable for the spring season. Miss Dior Eau Fraiche presents a touch of youthful elegance, charm and gentility. This also corresponds with spectacular bottle designed in the spirit of a number of Miss Dior. Very elegant shape, transparent glass and massive cap refers to the classic timeless style. A small ribbon tied around the neck again testifies to the youthful beauty and subtlety characteristic for young women and girls. Miss Dior Eau Fraiche is wearable for all occasions in your life and especially during the day.